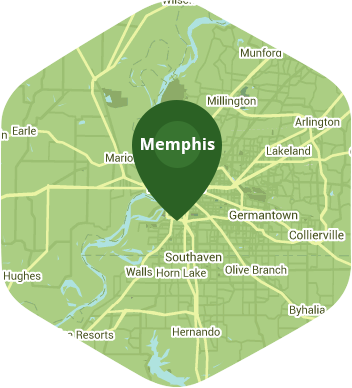 Book a skilled lawn pro in Memphis. Backed by a total satisfaction guarantee and amazing customer support. Get the #1 rated lawn mowing service in Memphis, TN. Lawn Love is lawn care made easy. FREE estimates and quotes on Memphis lawn mowing services. It's never been easier to get the best lawn mowing pro to your door today. Book now and see how easy it is. Memphis is Tennessee's largest city and has a rich and storied history to it. Besides having great barbecue, Memphis also has a very lively music scene. It hosts the annual Beale Street Music Festival every May and is the place where "The King" Elvis Presley was born and raised. His estate, Graceland, hosts tours regularly and provides us with a glimpse on how he used to live. You can also visit the Memphis Botanical Garden to see a greener side of the city. With so many great sites in this city would you really want to spend your weekend behind a lawn mower? Let Lawn Love do your lawn mowing for you because you deserve to enjoy your free time. The grass on your lawn needs to be mowed regularly as it helps keep the rest of your garden looking great and healthy. It helps remove pests and weeds from your lawn, and it also helps keep the height of your grass at an even length. This makes it easier for the rest of your lawn to get an equal amount of nutrients, sunlight and water. Lawn Love has independent lawn experts who have an average of 10 years of experience, and lawn mowing happens to be one of their specialties. Customer satisfaction has always been one of our top priorities, and our friendly customer service staff at 901-410-4492 would be happy to take your call and assist you in setting up your lawn mowing service. You can also get a free online quote to check out our prices.